1st appearance of Loki, Heimdall, Asgard and Odin (cameo). 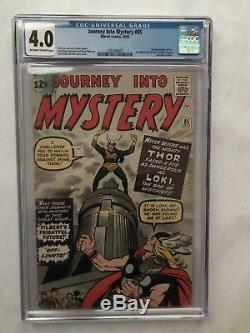 The item "Journey into Mystery #85 (Oct, 1962, Marvel) CGC 4.0 Off-white to White pages" is in sale since Wednesday, November 7, 2018. This item is in the category "Collectibles\Comics\Silver Age (1956-69)\Superhero\Thor".719" and is located in Pueblo, Colorado. This item can be shipped to United States.